Will they succeed in their quest? Or will you help thwart the rise of the demon lords? - Each pack contain 4 random prepainted miniatures. Let me say i love these things. I've only started recently buying them, but i want the entire collection now! The paint job is of a good quality, better than anything i would ever be able to do, and you can tell care has been put into them, even if they are not perfect. They came packed up well, and i was absolutely flabbergasted that i got these in hand, in the UK, only 8 days after ordering! Amazing. The only thing i'd say is that due to randomness, often the figures you get won't fit into what you are playing. I got a Roper, great i can use that, and then a brass wyrmling (lovely to have for conversations, but never in combat) and a drow fighter and a duregar warrior. They are nice, but i'm not anywhere near the underdark, or where i could encounter them in my campaign. Also, my personal preference would to have more creatures/abominations, rather than humanoids, but oh well, that's the randomness for you! I was very impressed. Miniature Market does a lot of good things, but they did it now. The package was securely packed, unlike most other places, and I even pulled a dracolich! Good minis, with a few drawbacks. Some good to excellent sculpts in this set, but as often is the case the paint jobs are often muddled. If you're into repainting the minis, there are some great ones to work with. If you're not, the paint jobs are for the most part acceptable. A good selection of critters that you'll actually use in a dungeon crawl. Unfortunately, some of the most interesting critters are only found in the rares (rust monster, grell, spectator, xorn). Some of the rares are excellent (beholder, a couple of dragons, mind flayer lich, etc), while others leave you regretting that when you finally got a rare, that was the one you got (hook horror, elf archer, blink dog, bugbear hunter, helmed horror). Don't get me wrong, they're not bad minis, but as a rare they are a disappointment. A big drawback, common to recent sets: a number of the minis come with clear pegs that are supposed to connect them to the bases, and the pegs often don't fit without a lot of work, possibly including trimming parts, gluing in the pegs, and/or slightly melting the ends of the pegs to get them to squeeze in where they are supposed to go. Overall, some excellent minis to have in your collection, very few that feel like useless filler, some good minis in the uncommons and not just the rares, but some quality issues that drag it down from a 5 to a 4 in most categories. 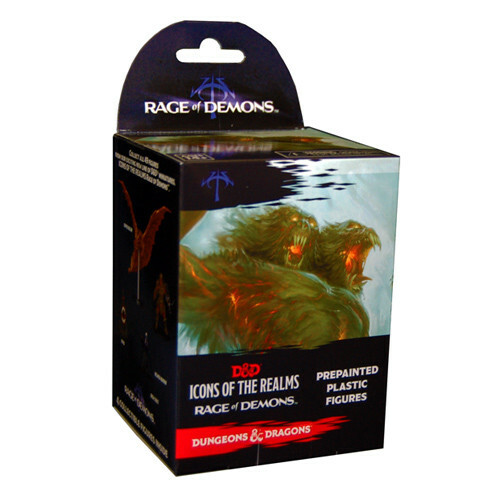 The rage of demons booster contain a lot of minis that can be used for gaming. The three drow pieces are good. There are some good pc pieces like the half Orc paladin and the human wizard. The monster selection is good, particularly if you want to play a campaign following the current rage of demons storyline. Only bad thing is the 2 best minis are very rare.